Our library does not appear to have this book. I'll keep looking. It sounds like it may be a bit slanted. During the enlightenment when our country was founded it was believed by many founding fathers that religion was on the way out (much like slavery -- and they were mistaken on both counts). The primary author of The Declaration of Independence Thomas Jefferson also coined the phrase, "wall of separation between church and state," and edited his own personal version of the Bible (which would not be very highly regarded by most Christians). In reading the writings of Benjamin Franklin, John Adams, Thomas Paine, and James Madison, to name four, it becomes clear that they did not endorse many religious views. I am not saying Mr. Gordon's book is wrong -- I haven't even read it. I will as soon as I can get my hands on a copy. I would merely suggest it may not be entirely balanced on it's own. This brief comment certainly opens up a number of topics of conversation. While I respect this person's willingness to post his opinions on this subject, I'm sorry to say he is quite incorrect on a number of points; that is assuming that he doesn't have access to materials written about or by the founders that I haven't had the privilege of reading. I'd like to discuss these points in order. "...it was believed by many founding fathers that religion was on it's way out." Now you might make the argument that those affiliations were a requirement of the time and a political necessity. And I'd have to agree that no one can really know someone else's relationship with God. But since all we can know for sure ARE these proclaimed affiliations and the words these men wrote, I must disagree with the commentator's contention. There is essentially no evidence that many (or even a significant minority) of the Founders thought that religion was “on its way out.” In fact, even the Declaration of Independence mentions or refers to God at least seven times. Now as to the statement, "Thomas Jefferson coined the term 'wall of separation between the church and the state...'"
Well, as a believer in Christ, I must say that I'm quite glad that he did. Oh, not in the way that so many today misuse this statement, nor in the way that it is removed from the context in which it was said. No, I fully support Mr. Jefferson’s statement because of his original context. President Jefferson wrote those words in a reply to a letter from the Danbury Baptist Association in 1802. The Danbury Baptists were a religious minority in Connecticut, and their complaint to the president concerned the RIGHT to worship as they desired, rather than their style of worship being a granted privilege by their State, or as they put it - as "favors granted." Jefferson was very careful in his reply; especially so because at that time the preeminent position of the Federal government over the powers of individual states was not yet enthroned. So, in writing to the Association, he could honestly address only the Federal role (or lack thereof) with regards to religious freedoms. Jefferson wrote, "Believing with you that religion is a matter which lies solely between Man & his God, that he owes account to none other for his faith or his worship, that the legitimate powers of government reach actions only, & not opinions, I contemplate with sovereign reverence that act of the whole American people which declared that their legislature should 'make no law respecting an establishment of religion, or prohibiting the free exercise thereof,; thus building a wall of separation between Church & State." He finished his letter with, "I reciprocate your kind prayers for the protection & blessing of the common father and creator of man, and tender you for yourselves & your religious association assurances of my high respect & esteem." As the letter attests, Mr. Jefferson was a firm believer in the right of the free exercise of religion. In fact, he is famously quoted as saying, "It does me no injury for my neighbor to say there are 20 gods, or no god. It neither picks my pocket nor breaks my leg." So was Mr. Jefferson a believer? Again a quote: "Can the liberties of a nation be thought secure when we have removed their only firm basis, a conviction in the minds of the people that these liberties are of the gift of God? That they are not to be violated but with his wrath? Indeed I tremble for my country when I reflect that God is just: that his justice can not sleep forever: that considering numbers, nature and natural means only, a revolution of the wheel of fortune, an exchange of situation is among possible events: that it may become probable by supernatural interference!" So what did Jefferson mean by a wall of separation? Let's ask him. Mr. Jefferson was extremely concerned about the idea of a coercive State Religion, a concern I share. But he was never opposed to such things as prayer in school or the ten commandments carved on a stone at a county court house. In 1774, in the Virginia Assembly, Jefferson introduced a resolution calling for a Day of Fasting and Prayer. Now as to the statement: "...his own personal version of the Bible (which would not be very highly regarded by most Christians)..."
This no doubt refers to the so-called Jefferson Bible. I say so-called because Jefferson never called it that. His title for the work he created was "The Life and Morals of Jesus of Nazareth." It was never published in his lifetime. It was left to some later individual to call it "The Jeffersonian Bible." Now I have a confession. I have done much the same as Mr. Jefferson. But fortunately I've been able to use a word processor and a less "destructive" method of cutting and pasting various translations of the words of Jesus of Nazareth. Why would I do this? I assume for the same reasons as Thomas Jefferson: to learn, to the best of my abilities, the thoughts and commandments of the Word of God. Jefferson’s "Bible" was a study guide. He never used it as a replacement for the Bible. It was created as a learning tool for greater knowledge. Finally the comment: "In reading the writings of Benjamin Franklin, John Adams, Thomas Paine, and James Madison, to name four, it becomes clear that they did not endorse many religious views." First off, why should they? None of them were preachers. They were lawyers, scientists, farmers, and revolutionists. Second off, How do we know that they didn't? If the commenter is, like me, a product of the government schools, he probably wasn’t taught a lot of what these men said, especially with regards to religion. Thomas Paine: "I believe in one God, and no more; and I hope for happiness beyond this life." James Madison: "Whilst we assert for ourselves a freedom to embrace, to profess and observe the Religion which we believe to be of divine origin, we cannot deny equal freedom to those whose minds have not yet yielded to the evidence which has convinced us. If this freedom be abused, it is an offense against God, not against man: To God, therefore, not to man, must an account of it be rendered." “Believers who are in a state of grace, have need of the Word of God for their edification and building up therefore implies a possibility of falling." “To neglect the means for our own preservation is to tempt God: and to trust to them is to neglect Him." And John Adams, another Founder on the list, said: "Our Constitution was made only for a moral and religious people. It is wholly inadequate to the government of any other." I hope this helps the commenter in his continued study of both God's word and the founding of our great nation. There's a lot more to discover - always. I am enjoying seeing more posts by Husband of the Boss! I had heard of the "Jeffersonian Bible", but did not know much beyond that it seemed very heretical. I'll be interested in studying more on that topic when the time comes to homeschool in that area. Thanks for the history lesson! Fantastic! What a wonderful reply! Isn't it funny how the original words and actions of our Founding Fathers completely contradict the modern notion of "separation of church and state?" Clearly, our Founders had a much different idea of what that phrase meant, and that idea was rooted in their decidedly Christian worldview, rooted in the events of the Great Awakening (NOT the Enlightenment). It would be extremely difficult to look at that information and still believe that our Founders were anti-religion or anti-Christianity. Very interesting. This appears to be anything but an innocent misunderstanding. It's another attempt by our progressive liberal "friends" to rewrite history. They write a column, an article or a book and make several incorrect (but helpful to their cause) statements about our Founding Fathers, our heroes, traditions and so forth. Many semi-literate, dumbed-down and conditioned individuals read their misinterpretations (and let's admit it: their outright lies) and believe them. It appears this is being done to undermine the integrity of our Founding Fathers and "prove" that our Constitution is a flawed document written by flawed individuals. These deceivers are getting sneakier every day. We must be vigilant and aware of their methods and their purpose, if we want to remain a free democracy! I think that the idea of "Restoring America" in and of itself is a good idea. 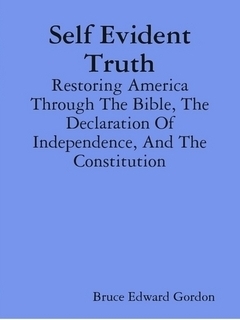 However, (I also have not read this book) I see what I believe to be a grevious error rising in some of the Christian community in these United States. That being the morphing or merging of a personal relationship with Jesus Christ with a red hot zeal for American patriotism! We are to seek first the Kingdom... not what we believe to be our idea of a "great nation". Oh man, I wish that someone/anyone in politics these days could speak only a fraction as beautifully as they did back in the days before we had our overpriced public education. Speak it and mean it. It is amusing that people think we have "evolved" for the better. Certainly the "Freedom of Religion" cry and "Church and State" dogma is used today in a way that I believe the Founders could not even conceive of it being twisted into. They expected freedom to be the Christian you wished not constrained by Calvinist principals against Methodist or Catholic over Anglican etc. One Nation under God... Not One Nation under Gods or not if you so wish. Amen, Husband of the Boss! An excellent and well written response. The libs are always taking our founders' statements out of context and twisting them to mean what they want. Just a little "digging" proves that what they are saying is nothing but lies and half truths. My recollection was that Jefferson's abridgment of the Bible was for it to serve as a basis for translation and through that effort as a tract to present the Messiah to the American Indians. Many thanks for the recitation of Jefferson's devotional words. He might be a fabulous poseur, a la most pro-infanticide "Catholic" leftists (I have great admiration and affection for orthodox Catholics, but contempt for the pretend pro-abortion pro-adultery "Catholics") but methinks he was instead the creature our politically correct elites cannot comprehend -- the thoughtful, well informed, articulate Christian. Wow!!! I really, really loved this! It makes me want to pray more for America and be ever mor vigilant in her care! Dearest (and only) Husband of the (dearest and only)Boss, this is an outstanding example of greatly needed and accurate insight into the faith of our Founding Fathers and the true history of how it figured into their work and dedication, of which we today are yet the blessed beneficiaries. It's also a beautiful testimony to your own faith, and gives us an intimate look int your walk with Our Lord. Nothing pleases me quite like the acknowledgment of His Divine sense of humor. I sincerely hope what you've written here will inspire the commenter to rethink their mistaken belief that the Founding Fathers thought religion was on its way out, and I hope he or she will do their homework and learn the truth about the role of faith in the founding of our nation and its important systems, such as public education. Although I can't offer a proper citation here, I can say with certainty our public education system was founded for the expressed purpose of enabling all Americans to read and comprehend Holy Scripture. That this same educational system is now used to distort and revise history and to in fact drive God and Scriptural values out of our schools is beyond ironic. I also pray the commenter you're responding to isn't a school teacher, in any system, at any grade level. I shudder to think of how many young minds are being impressed by teachers who hold such warped views. Once again, good work, HotB. It's always a real treat to read your stuff. Anonymous 11:43 and I are on the same page. I went back to the original comment and saw the screen name. Then went to that person's blog (wouldn't you know it, a blogger - maybe seeking new traffic?) It was quite "enlightening" in its own right. Although having divergent opinions is welcomed here, I still wish to find a blog that is not beset by liberal blather. I get enough of that daily as it is. Yeah, I'm looking for a "Sanctuary City". Thanks so much for this response. You said the things I would have said, but much better. Very interesting post! Me and the DW were discussing some of these same things just the other day in context to the differences between "Law" and "Justice", etc. I must say I really appreciated this quote: And John Adams, another Founder on the list, said: "Our Constitution was made only for a moral and religious people. It is wholly inadequate to the government of any other." It neatly sums up a great many of the modern day problems we see with this government. While the religious views of various founders, as well as the religiosity of the people of that time, are subjects of some uncertainty and controversy, it is safe to say that many founders were Christian of one sort or another. In assessing the nature of our government, though, care should be taken not to make too much of various founders’ individual religious beliefs. Their individual beliefs, while informative, are largely beside the point. Whatever their religions, they drafted a Constitution that plainly establishes a secular government in the sense that it is based on the power of the people (not a deity), says nothing to link that government to god(s) or religion, and, indeed, says nothing substantive of god(s) or religion at all except in a provision precluding any religious test for public office and in the First Amendment where the point is to confirm that each person enjoys religious liberty and the government is not to take steps to establish religion. This is entirely consistent with the fact that some founders professed their religiosity and even their desire that Christianity remain the dominant religious influence in American society. Why? Because religious people who would like to see their religion flourish in society may well believe that separating religion and government will serve that end and, thus, in founding a government they may well intend to keep it separate from religion. It is entirely possible for thoroughly religious folk to found a secular government and keep it separate from religion. That, indeed, is just what the founders did. I have to confess, respectfully, that I don't understand this kind of thinking. We are commanded to love God with our entire being and to love others just as we love ourselves. We are told by Jesus that these commandments are inseparable. My question is, what better way is there to show our love and obedience to God and our love for our fellow man than to spread the Good News of Jesus Christ and to fight (with a red-hot patriotic zeal) for the foundational principles of individual God-given liberty that America was built on? Maybe I have made an incorrect assumption, but it appears to me that Anonymous is saying we should keep our religious life separate from the rest of our life and that we are not to equate being patriotic for the principles of the American Revolution with the principles of Christianity. I believe that they are linked, and so did our Founding Fathers. The Founders believed that nations as well as men are all governed by The Laws of Nature and of Nature's God. They believed that liberty was a gift from God to all men in equal measure. They believed that the perfect hierarchy for self governance and the protection of God-given liberty was one in which God is over men and men are over government. They believed that religion and Christian morality were indispensable supports of individual liberty within a constitutional republic. We have a Christian duty to love God with our entire being and to make His Son Jesus Christ the Lord and Master of our lives. We have a Christian duty to tell others the Good News of Jesus Christ and His perfect gift of salvation to all who call on his name. We also have a Christian duty to fight, with a red-hot patriotic AND Christian zeal, for the Christian AND American principles of individual God-given liberty. To do less would be a sin. Where is the Biblical support for "having a Christian duty to fight with a red-hot patriotic AND Christian zeal etc..."
One must be careful with what they let their patriotism dirve them to think and do. the word of GOD, to be null and void", and without effect. Jesus and the Apostles all loved their enemies unto death! "Jesus said unto him, 'Thou shalt love the Lord thy God with all thy heart, and with all thy soul, and with all thy mind. This is the first and great commandment. And the second is like unto it, Thou shalt love thy neighbour as thyself. On these two commandments hang all the law and the prophets.'" I read Jesus' words in that passage and I think to myself, "What better way is there to love my neighbor as myself than to share with them the Gospel and to fight, with a red hot Christian and patriotic zeal, for the preservation of their God-given individual liberty and unalienable rights?" Does this mean that I am supposed to worship America or the founding principles of America? Certainly not. I am supposed to worship Almighty God through His Son, Jesus Christ. Am I supposed to support my country at all times, even if my country violates God's laws? My country right or wrong? Absolutely not! I am commanded to follow God's laws and to speak out, pray about and fight against all violations of God's law. In my opinion, this gets right to the very heart of what it means to be a patriotic American. I can't speak for others, but my patriotism drives me to speak out and to pray about and to fight in defense of the individual liberty that all men are equally endowed with by our Creator--Almighty God. Patriotism is a very different animal than nationalism. I take that distinction seriously. Those of us who are Christians have a divine mandate to tell others about the Good News of Jesus Christ and to fight for the individual liberty and equal justice under the law that God has blessed us with. To do any less than that would be to fail in following God's command to love our neighbor as ourselves. That's a sin. Bruce, there is no such divine mandate "to fight for the individual liberty and equal justice under the law that God has blessed us with." I agree with what was mentioned in a previous comment... and believe that you may be confusing God's will with man's traditions. As Christian's, that certainly is God's will for us to do. 1 The Pharisees gathered around Jesus. So did some of the teachers of the law. All of them had come from Jerusalem. 2 They saw some of his disciples eating food with "unclean" hands. That means they were not washed. 3 The Pharisees and all the Jews do not eat unless they wash their hands to make them pure. That's what the elders teach. 4 When they come from the market place, they do not eat unless they wash. And they follow many other teachings. For example, they wash cups, pitchers, and kettles in a special way. 5 So the Pharisees and the teachers of the law questioned Jesus. "Why don't your disciples live by what the elders teach?" they asked. "Why do they eat their food with 'unclean' hands?" " 'These people honor me by what they say. 7 Their worship doesn't mean anything to me. They teach nothing but human rules.' —(Isaiah 29:13) 8 You have let go of God's commands. And you are holding on to the teachings that men have made up." 9 Jesus then said to them, "You have a fine way of setting aside God's commands! You do this so you can follow your own teachings. 10 Moses said, 'Honor your father and mother. '—(Exodus 20:12; Deuteronomy 5:16) He also said, 'If anyone calls down a curse on his father or mother, he will be put to death. '—(Exodus 21:17; Leviticus 20:9) 11 But you allow people to say to their parents, 'Any help you might have received from us is Corban.' (Corban means 'a gift set apart for God.' ) 12 So you no longer let them do anything for their parents. 13 You make the word of God useless by putting your own teachings in its place. And you do many things like that." Christianity is under attack both within and outside the USA. The USA is under attack both within and outside the USA. This "dual front" is not a coincidence. America has stood as the beacon of hope for individual freedoms, and Jesus has stood as the beacon of hope for individual salvation. This is not a coincidence, either. Our Founding Fathers had divine inspiration - there is no other explanation for their victory over the most powerful nation on earth at that time and for their ability to convince a reluctant group of colonists to support them. Anybody who has ever experienced Divine Inspiration or Divine Intervention knows that it is real and it is powerful. It is no coincidence that as America turns towards securlarism that we have lost our way as a nation and have become greedy, selfish, hostile, and deceitful. Look at our politicians, most of them are certainly not people to emulate. They don't represent me, and that's because far too many of them have abandoned Jesus in favor of their own sense of power. Jesus is our salvation. Only if America turns back to Him will we be able to restore our Founders' principles and return to our Constitution. If we fail to embrace Jesus, we doom our country to failure. And then the world is doomed to another Dark Ages. This is not putting America before Jesus, this is putting Jesus in front of America. Jesus leads, we follow. Jesus is absent, we fail. It's that simple. To return to Jesus and to save America requires individual action, not the body politic. We change our hearts and we change this country. Mr. Gordon, I'll be buying a copy of your book. Thanks for standing up for both Jesus and for America. One more thing, the Bible tells us that only the churches of Philadelphia and Smyrna were teaching God's word. So be wary of churches that teach man's word. Many so-called Christian churches have become purveyors of class warfare, have embraced perverse behavior, and have become progressive. Whenever some wisecracker asks me "What would Jesus do?" I answer, "You're about to find out." Thank you, Anonymous Patriot. There are many who just don't get it, but I pray that their eyes will be opened. God bless you! Interestingly enough, here is a NIV text from Matthew 15 making a similar point about men's traditions. I also noted that Anonymous 12:53 was correct in pointing out that "there is no such divine mandate "to fight for the individual liberty and equal justice under the law that God has blessed us with." This point has not been addressed. Far too many "Christians" are far too willing to break with the commandments of God in order to seek what they believe to be their own divine fulfillment! I'm going to link this post on my blog. I found it thought provoking and the points made need to be spread. If you would no like me to do this please let me know and I will remove the post. Respectfully, it baffles me when I hear well-intentioned Christians say things like, “There is no divine mandate to fight for individual liberty or equal justice for all.” I don’t understand the kind of mindset that makes a person so blind to God’s Holy Word. Of course we have a divine mandate to fight for individual liberty and equal justice under the law for others, and of course we must do so with a red hot Christian and patriotic zeal. Jesus says that we are to love our neighbor as ourselves (Matthew 22:39). Jesus says that we are to hunger and thirst for righteousness (Matthew 5:6). Jesus says that we are to be the salt of the earth and the light of the world and that we are to “let your light so shine before men, that they may see your good works, and glorify your Father which is in heaven.” (Matthew 5:13-16). OK, let’s put those words from Jesus in practice. If I see our federal government racking up trillions of dollars in debt, for example—debt that will enslave my children and grandchildren to leviathan government—don’t I have a responsibility to fight against that? What is there that is “righteous” about that debt? What is there that is “loving” about me if I ignore that issue and just let my descendents deal with it? Should I hide my light under a bushel and just let it all happen while I “play church” and act like a pious Christian on Sundays? I say no. Take any modern-day issue of life, liberty, property/pursuit of happiness and apply the above test to it. What about abortion? Socialized medicine? Ever more burdensome government regulations that tell we the people what we may eat, how we may use our property, what we may spend our money on, what we can and cannot be taught in government schools, how we may pray to and worship Almighty God? Take any of those issues. Shall we ignore them just because there isn’t a specific verse in the Bible that says, “Thou shalt fight for God-given individual liberty and equal justice under the law”? Or should we take Jesus’ words to heart when he said to love our neighbors as ourselves and to hunger and thirst for righteousness and to be both salt and light in the world and to proclaim liberty to those in captivity (Isaiah 61:1)? I believe the answer is obvious. 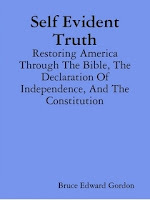 That’s why I wrote this book, “Self Evident Truth.” It is crucial that those of us who call ourselves Christians re-learn America’s founding principles and their roots in the Word of God. Liberty and justice in America are dying and a big part of the reason why is because too many Christians have the notion that “that’s not my job” to fight against the loss of liberty. We must defend and protect the gifts God gave us…after all, isn’t that a great way of showing God how much we love Him? God said those words to Solomon, but wouldn't they also apply to all of God's children who are "called by my name"?